Magic is dangerous — but love is more dangerous still. When sixteen-year-old Tessa Gray crosses the ocean to find her brother, her destination is England, the time is the reign of Queen Victoria, and something terrifying is waiting for her in London's Downworld, where vampires, warlocks and other supernatural folk stalk the gaslit streets. Friendless and hunted, Tessa seeks refuge with the Shadowhunters, a band of warriors dedicated to ridding the world of demons. Drawn ever deeper into their world, she finds herself fascinated by — and torn between — two best friends and quickly realizes that love may be the most dangerous magic of all. If you've been following this blog for the short while it has existed, you probably already know I gave up on The Mortal Instruments after the third book. So you might be a bit surprised to see this review. 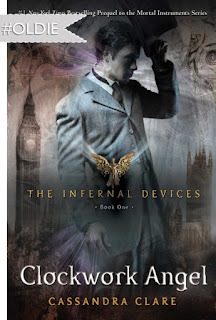 But after hearing so many good things about The Infernal Devices and it's superiority to TMI, I decided to give it a shot, hoping it might be a different reading experience than the former. I desperately wanted it to be. I wanted to be swept into Clare's world like so many others do. But alas, it was not in the stars. Again. As I've mentioned before, the main issue I have with Clare's books is that they just fail to properly grab me. I always end up reading them really slowly. It tires me. In this particular story, I kept flipping to the end, in the hope of peaking my interest. It mostly didn't help, aside for spoiling the Big Bad for me, which only served to make me upset about the lack of hinting in his direction (that I could note). Then there was the romance. In TMI (first trilogy), I was kind of on-board. I liked Jace, and I liked that there was never really a love triangle. I was looking forward to the romance in TID, seeing as everyone freakin' loves Will and Jem. Did I get what I was hoping for? Nope. Aside for the fact I did not swoon for Will (he was kind of too inconsistent for me, hot than cold and over again, and while I'm sure we're going to explore his past and get his redemption, that's not done in this book), I did not understand why Tessa was falling for him. The few decent interaction they had ended poorly. It was insta love, from start to finish. Jem, at the very least, was very sweet to our MC. Falling for him, especially at this point, would've made much more sense. To be completely honest, I was way more interested in the side characters, such as Charlotte & Henry, and Sophie. I kept looking forward to their scenes, wanted to see how their stories would play out. If I read on (which will probably happen as I already own the third book), it will be mostly for these guys. Sorry!